We’ve all had it with this winter and the impact of the weather has snowballed – literally and figuratively – through my life. I can handle the cold fairly well on my bike, but am not willing to venture forth in snow and ice. And the Arctic vortices that hammered us this season – with temperatures in the teens and fierce wind chills – were more than I could face on two wheels. But when I can’t bike, my mental health tends to plummet. I feel sluggish and have a hard time remembering how I ever had the energy to get around by bike. I even withdrew from twitter – as most of what I follow there is bike-related. I had nothing to blog about. Often, I drove to work, which made things even worse, as I quickly became reacquainted with all the reasons that driving is the worst way to commute. Each time we had an island of decent weather I took the opportunity to get back on the bike, and immediately felt the salutary effects. As the temperatures warmed over the past couple weeks, I was like a prisoner set free – hopping on my bike at every opportunity. So, when I got back on twitter the other night and saw that it was already the middle of the winter errandoneé, I didn’t panic – because I had just spent the past six days errandoneeing without knowing it. All right – I didn’t photo-document each trip, but I will recreate the evidence. 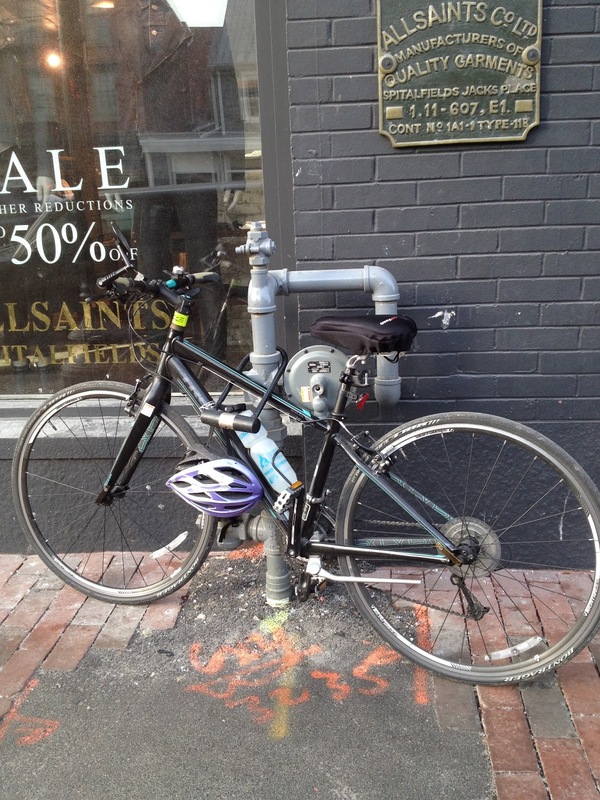 Trip 1 – March 8, 2014: This trip shows just how desperate I was to get on the bike. I had signed up for a workshop at the Writer’s Center in Bethesda (see details below – a fun break from the more serious things I’ve been writing of late). The most direct ride from Arlington entails taking Chain Bridge, backtracking about half a mile along the Tow Path, and then riding the Capital Crescent Trail to downtown Bethesda. I knew the Tow Path might be a bit iffy, but I totally underestimated how treacherous it turned out to be. I never like riding on gravel with my skinny tires, but gravel was the least of my worries. The mud was deep and the path was still icy in many places. It was very slow going and messy, messy, messy. I had to walk through several areas, and was delighted when I finally made it to the CC, which was mostly clear, but also still had a few icy patches. Distance: 10 miles; Category: community meeting. 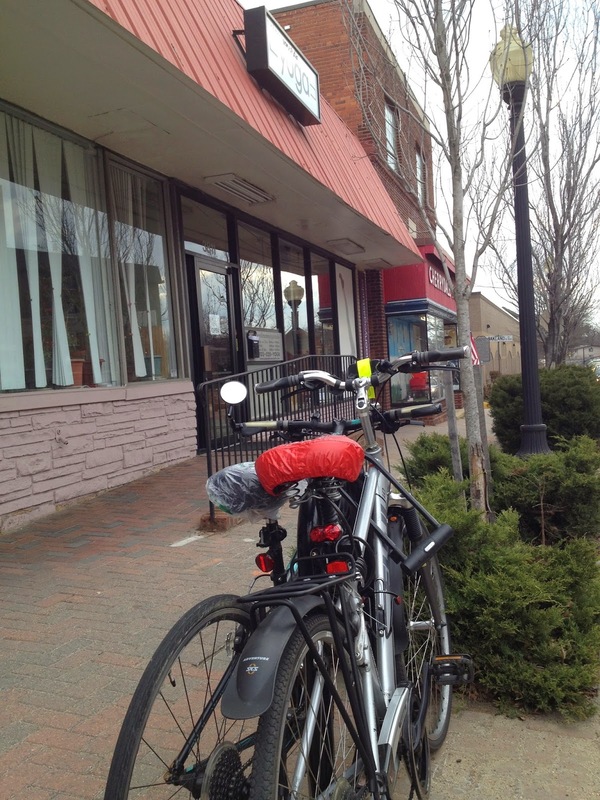 Trip 2 – March 9, 2014: Rode to yoga, noticing how overcast the morning was. I was a little disappointed that it wasn’t sunny, but with the balmy temperature, how could I complain? Since I’m photo-documenting after the fact, I will brag a bit about how great the Arlington Sun and Moon studio is by posting the “Best of Arlington” award we got for 2014. Distance: 5 miles, round trip; Category: personal care. Trip 3 – March 10, 2014: Rode to work and was delighted to see not a drop of ice on the path, as there had been just the week before on the couple nice days that I was able to get back into bike commuting. I arrived a bit on the late side, and most of the parking in the bike cage was already claimed – a testament to the eagerness of my colleagues to also resume their two-wheeled commutes. Distance: 10 miles; Category: work. Trip 4 – March 10, 2014: Rode to my evening writing class, but went early to spend an hour in the library, researching an article I’m preparing for class. For the return trip, I biked to the McPherson Square metro, which I took (with bike) to East Falls Church, and rode home from there. Thus, total distance: 3.5 miles; Category: library – and the latter half of the trip was in the dark. I use my rechargeable Light-Motion Urban 200 to light the front, and always keep a red blinkie on my backpack. Trip 5 – March 11, 2014: Careful readers of this blog may recall that I had a seven-month car-free experiment last year. By the time my child returned my Prius, the interior had taken quite a beating. So I took the car to Sonic Car Wash to have the interior steam cleaned. I put the bike on my rack and drove to Sonic, which is conveniently located right off the W&OD Trail. The staff made many joking comments about not cleaning bicycles. Actually, I wish they could have, as the bike was still pretty caked with mud. I biked home and then back in the afternoon to pick up my sparkling almost-like-new car. Distance: 5 miles round trip; Category: store. Trip 6 – March 12, 2014: I knew that rain was predicted for later in the day, so I took a mid-day ride to REI to return the bike rain pants I’d purchased for my child when they lived in the Pacific NW, as they had never been worn. While I was at it, I decided to return the rain jacket I’d bought for myself and had never been satisfied with because it was only effective in drizzle, and useless in a downpour. They advertise that you can return anything, any time. Well, it turns out they changed their policy in 2012, but they were nice enough to give me a full refund anyway. But the best part of the trip was running into two of my yoga students out for a walk. I was just at the point where I was trying to figure out where to cut from the W&OD Trail over to the 4 Mile Run Trail and, from there, where to find the path through the grounds of the Carlin Springs Nature Center. They showed me where to go, a double bonus. Distance: 10 miles, round trip; Category: I’m going to call it bike shop, as I was returning bike gear. When I got home, I gave my bike a decent cleaning, and lubed the chain, feeling virtuous. 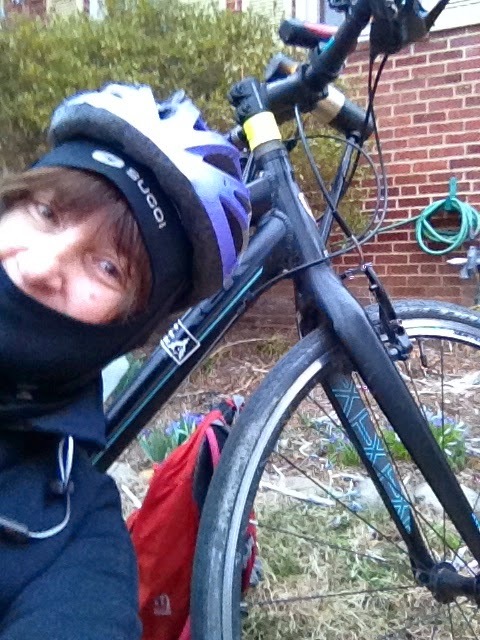 Trip 7: March 14, 2014: It was only 28 degrees in the morning, but the day promised to warm up, so I left for work before it was fully light – determined to log another “dark” ride. Hitting my first downhill moment, about 4 blocks from home, I was dismayed to discover my rear brakes were not working at all. I pedaled back home, thinking I’d have to take my old bike to work. But in a moment of intrepid adventure, I decided to investigate. Looking carefully back and forth between the front and rear brakes, I discovered that the rear brake was completely disconnected…apparently an unintended casualty of my Wednesday cleaning job. I am not very good at anything mechanical, but I kept studying the brakes – front and back – and figured out how to reattach the section near the wheel. I tried them out, but could tell something was still wrong. Alas – they were also disconnected at the top near the handlebar. Again, studying the other brake, I managed to reattach the top end, as well, and gave myself a big, happy pat on the back for achieving a new biking milestone. Yay me!! Distance: 10 miles; Category: work. Looking at my time when I got to work, my repair job only took me 10 minutes, and I felt another surge of pride. Trip 8: March 14, 2014: The evening was still balmy, so I biked to One More Page bookstore, which was having an author event. I needed to attend something of this ilk for my writing class and figured this was the perfect opportunity. 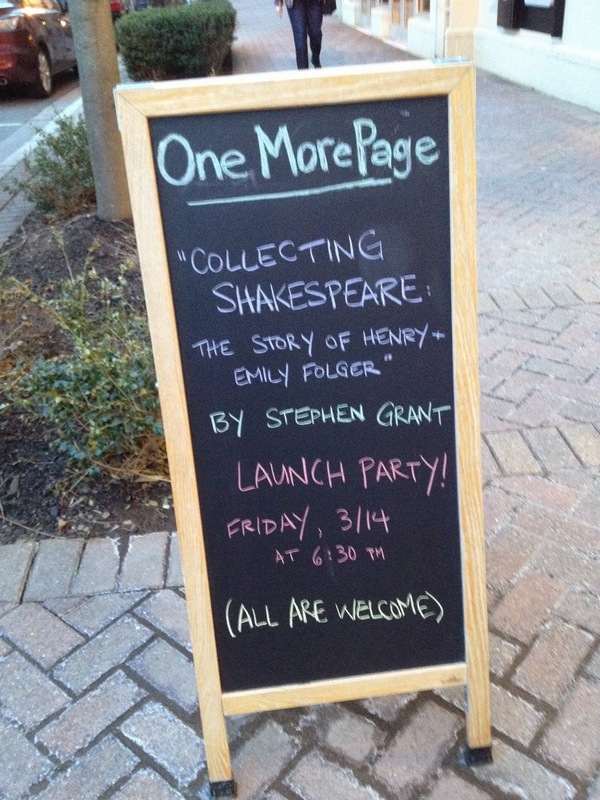 The author, Stephen Grant, wrote a biography of Henry and Emily Folger, who founded D.C.’s Shakespeare Library. There were lots of healthy munchies (fruit, veggies, nuts) but he only spoke for five minutes, and didn’t read, which was a bit disappointing. Distance 1.5 miles; Category: Library. 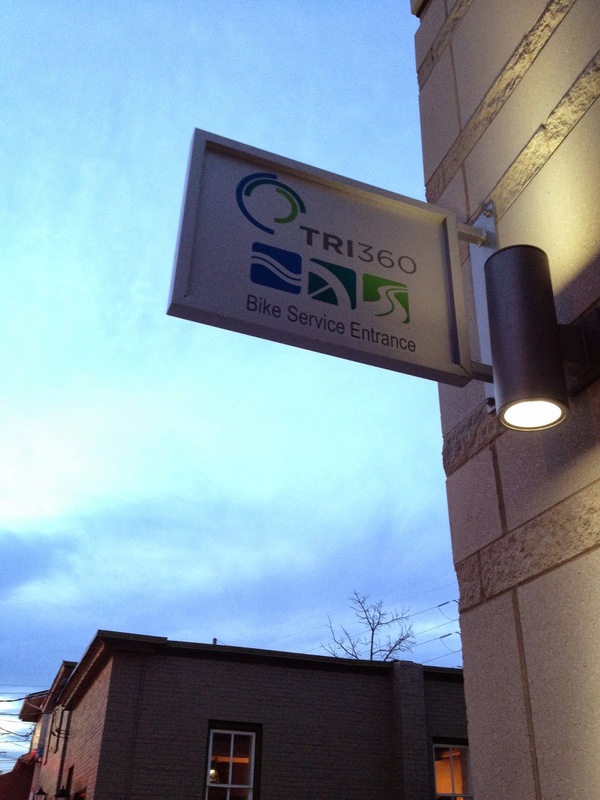 Trip 9: March 14, 2014: Since the book “reading” was so short and uneventful, I decided to cross the street and check out Tri360, the new-ish bike shop in Falls Church, which stays open until 7:30 on Fridays. Yikes – their stuff is pricy! I doubt I will return, unless I happen to have a bike emergency near that section of the W&OD Trail. The best part of the evening was riding home in the twilight, the almost-full moon peeking through the dark, leafless branches of the trees that surely will be putting out leaves soon. Distance 1.5 miles; Category: Bike Shop. Trip 10: March 15, 2014: Headed off to Pilates, waiting for the later, “easy” class, as this was to be the beginning of a full day of errandonnering. The day was predicted to be beautiful, perfect biking weather, but when I awoke there was a full gray cloud cover. By 8:15, the clouds had begun to clear, but the morning was touch-and-go and I packed a rain poncho, just in case. Distance: 2.5 miles; Category: Personal Care. Trip 11: March 15, 2014: From the yoga studio, I took the “city” route through Arlington to Northside Social, deciding to fortify myself with carbs before heading to Bethesda. When I coffeeneured last year, I determined that Northside had the most tasty looking baked goods. 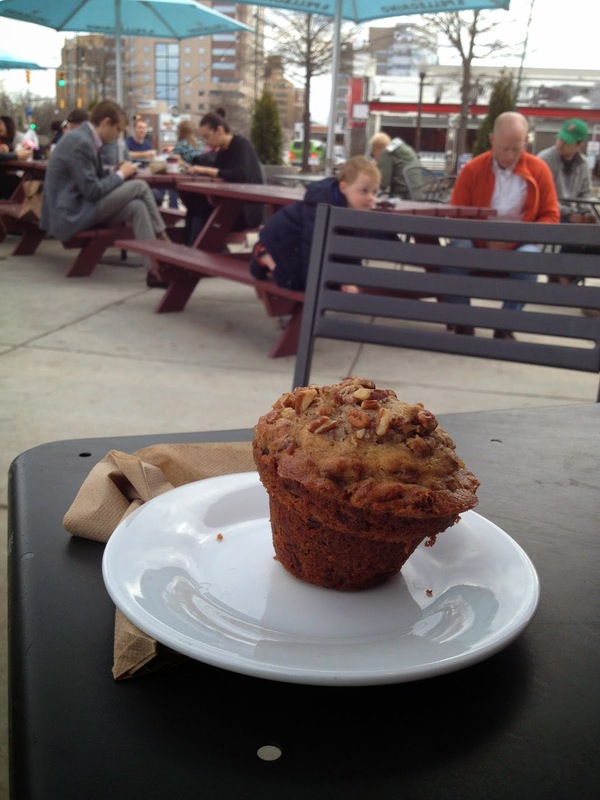 I chose the banana walnut muffin and it was every bit as delicious as it looked; they do not skimp on the nuts. Distance: 1.8 miles; Category: Breakfast. Trip 12: March 15, 2014: There was no way I was getting back on the Tow Path after last week’s misadventure, so I had already planned to take Key Bridge to the beginning of the Capital Crescent Trail for today’s trip to the Writer’s Center. It’s a longer route, but there wasn’t a bit of mud or ice. Of course, it’s still slightly uphill the entire distance and I admit I was dragging a bit, needing to stop a couple times for little breaks. Distance: 10.2 miles; Category: Wild Card. Trip 13: March 15, 2014: Since I was in downtown Bethesda, I decided to spend a little time walking around, as I’m not often in that neck of the woods. By afternoon the sky had cleared and it was a lovely, sunny day. The highlight was hearing a young man play the electric cello outside Barnes and Noble, where a substantial crowd gathered. I then went inside and browsed the magazines, trying to get ideas for places to submit my writing so I can augment my small but growing pile of rejection letters (ha-ha-ha). Despite my earlier fatigue, I was looking forward to the downhill ride back along the CC Trail (the previous week I’d visited my friend Jane after class, and she kindly gave me a ride home in the dark). Saddle-sore, but with a sense of accomplishment, I rode to the Rosslyn Metro, and put the bike on the bus from there to home, content with finishing off my errandonnee with a 23-mile day. Given the forecast of more snow to begin this evening, I was glad to double-up on my riding on such a perfect day. Distance 8.5 miles: Category: Store. 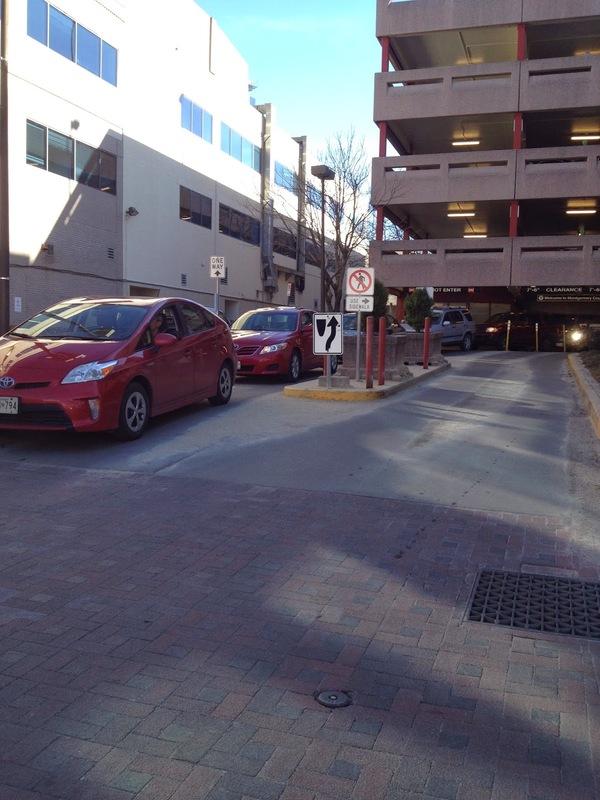 here's why you don't want to DRIVE to Bethesda.